Margaret K. McElderry Books, 9781481469180, 272pp. 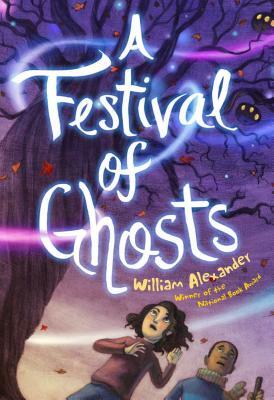 National Book Award winner William Alexander conjures up a spooky adventure full of excitement in this entertaining sequel to A Properly Unhaunted Place. Rosa Ramona Diaz, the ghost appeasing assistant librarian, has unleashed all the ghosts who were previously shut out of the small town of Ingot. Now ghosts are everywhere, and the town’s living residents are either learning to cope or trying to do the one thing no one can successfully do—banish the ghosts. At school, something supernatural is stealing kids’ voices and leaving them speechless. And it’s Rosa’s job to solve the mystery and set things right. Meanwhile her best friend Jasper is dealing with what remains of the Renaissance Festival, where ghosts from Ingot’s past are now battling it out with the ghosts of the Renaissance reenactors. And Rosa is experiencing a haunting of her own—could her father’s ghost have followed her here? Somehow Rosa and Jasper are going to have to find a way to bring Ingot back to normal—in a world where the living are now residing side-by-side with the dearly departed. Kelly Murphy is a New York Times bestselling author-illustrator and recipient of the E.B. White Award. She teaches illustration at her alma mater, the Rhode Island School of Design. Kelly currently lives in her native New England, surrounded by the flora and fauna featured in Together We Grow. "Alexander’s message—that acceptance and empathy, not building walls, is the answer—will resonate."